How Long should you Rest and Ice a Sprained Ankle? Everyone knows about R.I.C.E. (Rest, Ice, Compression, Elevation). In a nut shell, R.I.C.E. suggests you should rest and ice a sprained ankle. But, recent research has actually found that ice STOPS the healing process in its tracks and prolonged rest cannot repair strength and range of motion. So, ice actually inhibits the immune system in repairing and healing your sprained ankle and rest never lets you get back to full strength. I know… it’s the exact opposite of what everyone has been telling you and you may not believe it. But, the reality is that ice is ONLY good for short term pain management. Basically, it make the area numb which reduces pain levels for a little while. But, the cost is heavy. By icing the area and reducing circulation, your body cannot get the immune cells into the ankle to help clean up the damage and begin the repair process. What you need to understand is that the body’s healing response to an injury is brilliant and you want to help it, not get in the way and stop it. So, let’s take a closer look at rest and ice and how they harm the healing process of a sprained ankle. Takes 1-2 months to heal a sprained ankle. Up to 30% of people still have pain 1 year later! Does not properly or fully heal ankle damage. Does not improve range of motion in ankle. Does not heal nerve damage in the ankle. Does not improve strength in the ankle or calf. Does not improve strength in ankle stabilizers. Does NOT reduce risk of future sprained ankles. Gives you a false sense of security when you are out of pain. Decreases overall speed and jumping ability, since ankle never fully heals. Remember, swelling is the body’s first line of defense after a sprain. It helps immobilize the joint so you don’t do anymore damage. If you just rest and ice, the swelling will go down at a very slow rate by itself. In addition, scar tissue will most likely develop which really inhibits how far and well your ankle can move. Of course, just using rest and ice will help ensure that this inflexibility and weakness will never improve. One of the biggest issues with rest and ice as a primary treatment is that it does not confront one of the most important aspects of the healing process. When you get any kind of injury, there is always damage to the nerves and the ability of the central nervous system to communicate with them. We take this kind of communication for granted and just assume our body will do what we tell it to do. But, if you don’t deal with this damage, the body will be slower to respond after an injury and even once you heal, if you don’t do proper rehab. Rest and ice do next to nothing to heal this neuromuscular damage. Think about this for a second… you have a sprained ankle and you are sitting around with your foot up on something for weeks or months. When you stop using muscles, you know that they get weaker. If you continue to rest and rest without any strengthening or stretching, not only will your ankle heal much slower, but it will always be more susceptible to injury, because all the stabilizer muscles that protect your ankle will be severely atrophied. One of the biggest mistakes people make is going back to their regular life once they feel good again. The problem is that your ankle is still really weak and susceptible to injury. Most people never even consider it. A recent study by the NCAA showed that students who did not rehab their injury were 70% more at risk for the same injury to happen again. So, what does all this mean? 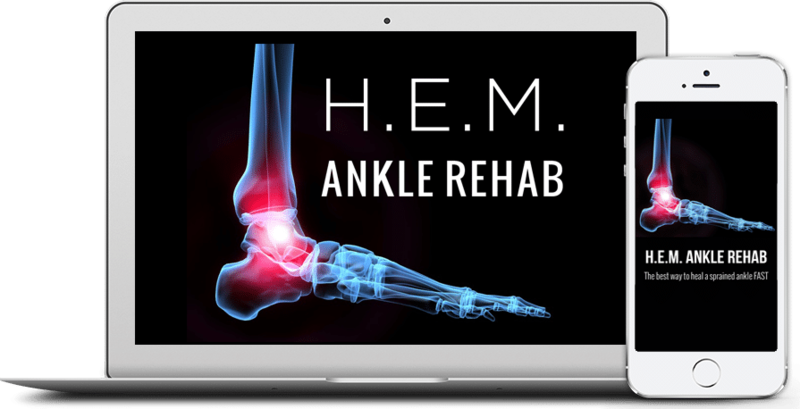 You need HEM Ankle Rehab, which is the best at home rehab program for fully healing a sprained ankle. It will help ensure you heal all the damage from a sprained ankle which will help ensure you have a healthy body. It’s safe and works fast and will help ensure you stay safe in the future.